We are new to farm life. In February of 2010 we moved from suburbia to rural Pa in a blizzard We have 4 children, 4 horses, 3 dogs, 1 cat and newest additions: 4 bunnies, 4 Easter Egger chicks, and 3 ducklings. Our first experience with chickens was at our awesome neighbors. They hosted the north eastern 2010 chicken stock last weekend. 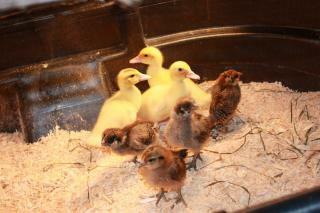 Our daughter was sooo excited when at the end of the day two really nice breeders gave her the ducklings and chicks. 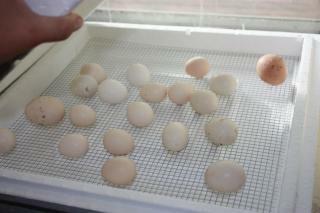 We also were given an incubator and some eggs, so we are on our way to our first hatch as well. Times have changed. After having chickens for a year we now have a full flock of about 25 birds. My daughter adores them and now is considering breeding three of her favorites: aracauna, dutch bantam, and serama. WE are building a divided breeding coop for her to do this. We attended our neighbor's 2nd chicken stock and traveled to the one in MD.. Who knew this could be so fun!! !